Rip-offs are a dangerous game, but NYPD robbery detective Miles Keller thinks he's found a good strategy: rip off rich New York criminals and then retire early, before word's out about his true identity. New town, new name, no worries. Retirement can't come soon enough, though. The NYPD is investigating him for the shooting of a hitman named Jack Deen, who was targeting a former police informant who also happened to be Miles's ex-lover. Miles thinks shooting hitmen counts as altruism, but in any case a murder charge would make life difficult. He's ready to go to ground, but then Nina Stone reappears in his life. Nina is a fellow heist professional and the estranged wife of an LA crime boss. Miles last saw her five years ago, when he was investigating her for bank robbery and looked the other way, for reasons he is still trying to figure out. Since then her life has grown more complicated: her husband wants her back, and he's dispatched his go-to gun thug to play repo man. Complicating matters is the fact that the gun thug in question is Bobby Deen, cousin of the dead Jack Deen - and Bobby wants vengeance. The stakes couldn't be higher, but Nina has an offer that could be lucrative. Maybe Miles can stick around a while longer and get the big payoff he's been waiting for? But luck has a way of running out and soon Miles is in way over his head. 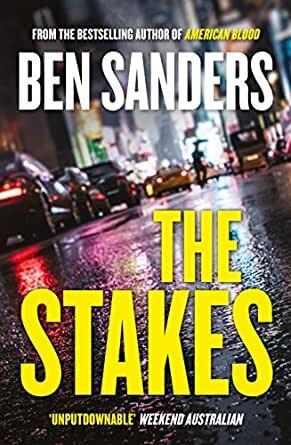 Effortlessly cool, suspenseful as hell and pure reading pleasure, The Stakes confirms Ben Sanders as one of our finest writers of crime fiction. Ben Sanders is the author of American Blood and Marshall's Law, as well as three New Zealand Fiction Bestsellers: The Fallen, By Any Means, and Only the Dead. Sanders's first three novels were written while he was studying at university; he graduated in 2012 with a Bachelor of Engineering and now writes full-time. American Blood, his highly-anticipated American debut, published in November 2015, and the second in the series, Marshall's Law, in April 2017. Sanders lives in Auckland, New Zealand. An original plot punctuated with sparkling dialogue, sudden violence and characters who kept me intrigued the whole way. I'll read plenty more of these. Just not up to his earlier standard. On this basis I won't read any more of his work. Ben Sanders quickly made his entry onto my “must read” list of authors on the strength of AMERICAN BLOOD and MARSHALL’S LAW. His latest offering, THE STAKES, takes place outside of his Marshall Grade mythos and has him turning his fine and talented hand to the caper subgenre with excellent results, creating from the ground up another complex yet sympathetic character in the form of NYPD detective Miles Keller. THE STAKES introduces Keller at a point in time when he is on administrative leave while he is being investigated for fatally shooting a hitman named Jack Deen. Keller’s actions appear on the surface to have been righteous, but there is just enough trace evidence to raise suspicion that things did not go down quite in the manner in which he described them. That suspicion is correct, but not for the reasons that the police investigators are checking out. Keller, as we quickly learn in the opening pages (following an intriguing vignette), is bent though not broken. He is not above helping himself to the ill-gotten gain of those on the wrong side of the law, even if it involves crossing over to that side (however momentarily) to do so. So it happens that Keller interjects himself into a money transfer and finds himself all the richer for it, his mood improved by the fact that no was injured in the process. But when the folks whose load he lightened turn up murdered the next morning, it complicates matters. Meanwhile, a woman named Nina Stone suddenly reappears in New York. Nina and Keller had a history several years before when her name came up in the middle of a robbery investigation. Now she is back in his circle, on the run from her husband, L.A. crime boss Charles Stone, who uses his film studio as a cover. Charles sends a quietly competent gunsel to New York to retrieve Nina and bring her back to California. The gunsel, whose attraction to Nina is one of his own worst-kept secrets, is Bobby Dean, the cousin of the hitman who Keller shot and killed. Bobby, of course, is interested in getting payback for Jack, and when he discovers that Keller is in her circle, he looks at the job as a golden opportunity to get on Nina’s good side, make some money and get revenge all in one fell swoop. But it’s not going to be anywhere near that easy for anyone, except maybe for Nina, who is almost always a step or two ahead of everyone else. Almost. I love caper novels, and this one is particularly well done. Sanders puts readers in the mind of Elmore Leonard and occasionally Wallace Stroby, though it is his own unique voice and flashes of terrific prose that ultimately shine through. Keller is hard to define --- he is probably a little too moral to be doing what he is doing on the side --- but that makes him all the more real. THE STAKES feels as if it is a stand-alone work, and not all of the interesting characters who are introduced in these pages make it to the end. Still, I wouldn’t mind seeing Sanders return several times to Keller’s world in the near future. I came across New Zealand author Ben Sanders with his first book set in the US, American Blood - he had written three set in NZ before that- which was a best seller. The followup Marshalls Law was equally impressive and now with his latest he confirms himself as one of the best crime thriller writers going around. NYPD detective Miles Keller is operating outside the law robbing criminals and setting himself up for life after the job. A bank robber he investigated years before approaches him with an offer but she also has her secrets - trying to rip off and escape from her crime boss husband who sends a gunman after her. And the gunman is after Keller too- he shot and killed the gunman's cousin. An intricately plotted novel with well developed characterization The Stakes is a thrill a minute story that keeps you guessing. There is a lot of Lee Childs and Jeffrey Deaver about Sanders. A top read. As I began to read Chapter 19, a feeling arose in me that I realized was a form of distaste at continuing to read this novel. I had struggled at the beginning, but persevered and at one point even thought I might like the book., But the plot just went on and on, so many characters, none very likable. So it all came together and I just put the book down. I did read the ending and the epilogue, which sort of verified my decision. This tory just didn't carry any weight with me.